Our photograph here shows the Mayor of Brighton and Hove, Councillor Brian Fitch and the Mayoress Mrs Norah Fitch. 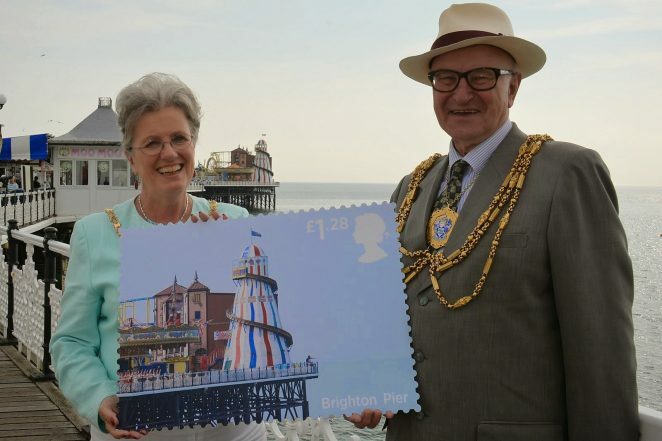 They are holding a large representation of the new Royal Mail stamp which is issued on September 18th and features the Helter Skelter on Palace Pier. If you want to find out more about the stamp set and first day covers you can visit the Royal Mail website. Interesting to see that this refers to the Palace Pier. Are they at last reverting back to the ‘real’ name for the pier? It always has and always will be the Palace Pier to me.